Tickets are selling at a rapid pace for the 2019 Rev. Dr. Martin Luther King Jr. Celebration—featuring comedian and author Trevor Noah, host of the Emmy- and Peabody Award-winning “The Daily Show”—on Sunday, Jan. 27, 2019, in the Dome. Due to the high demand for tickets for this event, all tickets for the $30 combined dinner (5 to 6:30 p.m.) and main program (7 to 8:30 p.m.) option have sold out. Tickets for the main program alone are still available and may be purchased online, in person at the Dome Box Office (Monday through Friday, 8:30 a.m. to 4:30 p.m.) and by phone (888-DOME-TIX or 315.443.2121, option “zero”). Program-only tickets are $15 for SU staff, SU faculty and the general public; $5 for students. The program includes a conversation with Noah, talking about his acclaimed memoir, “Born a Crime: Stories from a South African Childhood” (Random House, 2016); reflecting on the life and legacy of Dr. King; and discussing the global impact of the civil rights movement. Plus, there will be performances by students and Central New York community members, and presentation of the Unsung Hero Awards—recognizing local community members who have championed the plight of those in need. A new event format for this year, designed to accommodate increased attendance, includes the dinner from 5 to 6:30 p.m., followed by the separate main program from 7 to 8:30 p.m. Those who have purchased the “Dinner and Program” combined option will be seated in the west end zone during the dinner and then guided to a reserved section at the east side for the main program. See below. The 34th annual event is presented in collaboration with the University Lectures series and the Syracuse Reads program. For more information on the MLK Celebration, visit mlk.syr.edu. This diagram shows the event floor plan. 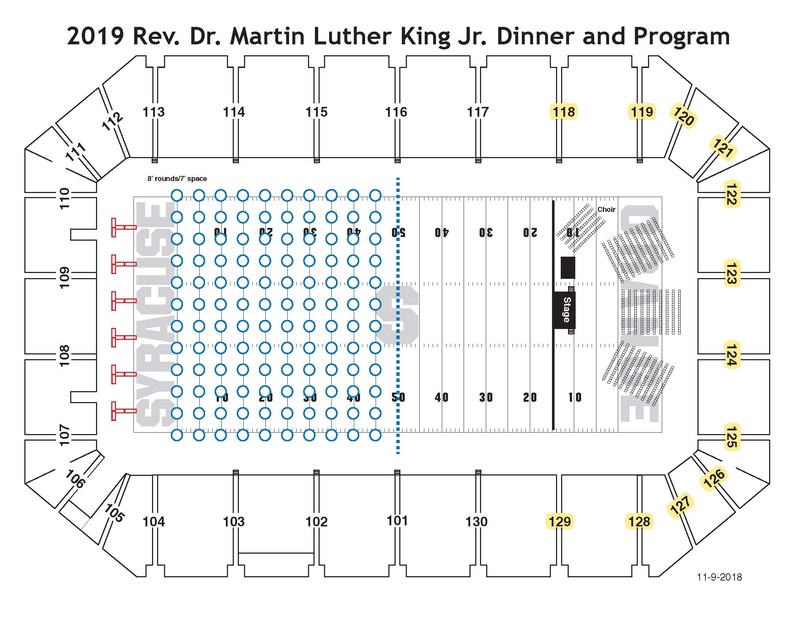 The sections highlighted in yellow indicate where all attendees are seated for the main program. The blue circles indicate dinner tables. All dinner attendees will be moved to a reserved section for the main program following the conclusion of the dinner.